I made this simple salad of blood oranges, green olives and olive oil for a snack the other day and it was so beautiful that I couldn’t help but take photos of it. This dish is so simple that at first I wasn’t planning on sharing the recipe here, but I absolutely love this photo and the taste of this Sicilian blood orange salad was spectacular. So even though there isn’t much to it, I decided this is definitely a recipe worth blogging about. Within a week of arriving on the island, I had written down my first Sicilian recipe. We were on a tour bus heading through the countryside towards some destination that completely escapes me now and our tour guide was giving us information about the orange groves that we were driving past. He mentioned that if anyone wanted to pull him aside later, he would share a recipe for a Sicilian blood orange salad. Of course I grabbed him the first chance I got and scribbled down the recipe on my little yellow notepad. It was a very simple orange salad. The ingredients were only sliced oranges, fresh garlic, fresh parsley, and olive oil. To be honest, I thought it was one of the strangest recipes I had ever seen. I grew up in California eating fresh oranges every winter but I had never heard of anyone eating an orange with garlic and olive oil. In fact, we never really did anything with oranges other than peel them by hand and eat them or make fresh-squeezed orange juice. But I was completely fascinated by the recipe and the first time I tried oranges paired with olive oil, I was hooked. Well now I am constantly trying new salads that involve oranges and olive oil and if you’ve been browsing through any other food blogs lately, you might have noticed that lots of other people are exploring this combination as well. If you want something a little more complex than I am giving you today, there are tons of citrus salads floating around the blogosphere right now. And a favorite orange and fennel salad that I tried recently can be found at Food Blogga. If you are new to eating oranges this way, this recipe is a simple and beautiful way to start. 1. Peel and section oranges with a sharp knife, leaving the pith and membrane behind. 2. 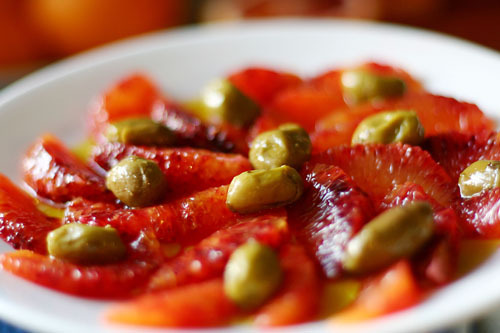 Arrange orange slices on a plate, drizzle with olive oil, then add a sprinkling of coarse salt. 3. Scatter some green olives over the plate and serve. Here are instructions for peeling and segmenting an orange with a knife. That *is* a gorgeous salad! Nicole-Thank you so much for the "Blogga" reference.Your photo is beautiful and I am so enjoying your stories, from 6,000 miles away, that I feel like I'm there. I can see why you are in love with that photo. Amazing! ooo nicole! you know, i've never tried olives and oranges together. i bet it's a great balance between sweet and salty. this is truly a gorgeous photo! definately one to add to the portfolio. the contrast between the brilliant blood oranges and the olive green... mmm. Nicole... will you share your secret for removing the orange sections so perfectly and beautifully without any of the pesky white stuff? Interesting combination, oranges and olives! Patricia: Thank you! The one thing I don't do much with oranges is bake. I should really do more of that!Shawnda: Thanks so much :-)Helene: Hope you enjoy it!Melanie: I think any kind of sweet citrus would be great! And black olives are definitely good too, I tried it!Susan: No problem! I probably wouldn't have thrown this combo together if I hadn't tried your salad first! Glad you're enjoying the stories :-)Kristen: Thank you :-)Amanda: You should definitely give it a try! It's a new combo for me too and I love it! Thanks for the compliment on the photo!Caroline: I just updated the blog post with a link to some great instructions for peeling and sectioning an orange while removing all that pesky white stuff :-)Nic: It's a perfect combo of sweet and salty! Nicole, this looks really good. I just went to look at your latest food shots and they make my mouth water. Are you a professional photographer? You're right about the photo. It's gorgeous. And the simplicity of the recipe is a hallmark of so much great European cuisine---taking a handful of perfectly chosen ingredients and combining them in exactly the right way. Deceptively simple, but absolutely delicious.As for mixing the orange with garlic and olive oil, pairing sweet and savory ingredients can produce really exciting flavors. I just made a dish with pork chops in a sauce that includes garlic, port wine and prunes. Very nice, if I say so myself. Hey Nicole, Had to stop bye to say beauuuutiful pic! I will definitely have to bring Chris' attention to this. And the combination in the recipe--so different. I have been craving olives...hmmm maybe I should try them w/oranges. :) I know my dad would love this recipe--it has everything he loves--shows a lil of his Italian coming out. He said he is waiting for your recipe book! Take care!!! Looks lovely. Glad you decided it was recipe enough to describe. Simple is good. That looks so incredibly good; feel like I could reach into the screen and take a bite.My mom was Sicilian and I remember her making a salad with oranges and fennel, and olive oil, and salt. So unusual to most people way back then, when I was a kid. I still love the flavors of orange and olive oil together...thank you for this! It looks great. And is the kind of thing I would enjoy eating! I love this salad, never would have though the combination of olives and oranges would be so great together.